Chemists in the US have managed to enhance a catalyst that can be used to destroy toxic or smelly chemicals in the air. The researchers introduced the catalyst, a polyoxometalate, into the pores of a crystalline metal-organic framework (MOF). The enhanced catalyst could be used to remove airborne contaminants, including industrial chemicals and chemical warfare agents. Oxidation is one of the best ways of removing airborne contaminants. To make the process easy, scientists are keen to use the oxygen from air in ambient conditions, but few catalysts manage to do this at a fast enough rate. Polyoxometalates (POMs) are a promising catalyst, because they are inorganic and therefore resist oxidative decomposition. However, to recover and reuse them, they need to be immobilised on a solid support. But this is tricky and often diminishes the POM's catalytic activity. Craig Hill, of Emory University in Atlanta, Georgia, and colleagues have now immobilised a POM in such a way that its catalytic activity is preserved and even improved. They used a Keggin-type POM, which contains a central atom surrounded by 12 metal ions, themselves connected by 40 oxygen atoms. 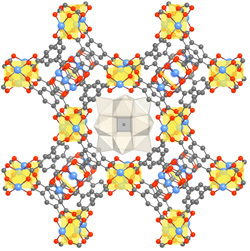 In the presence of this POM, the researchers created a metal-organic framework (MOF) known as MOF-199, so that the POM anions fit snuggly into about half of the pores, with counter-cations filling the other half. Hill's group found that the combination of the POM and the MOF improved the stability of both components in water. What's more, the researchers found that the combination improved the catalyst's oxidation of thiols, which smell like garlic, to disulfides and the decomposition of hydrogen sulphide. 'This is not the first paper describing POM-MOF immobilisation, but the results are outstanding,' says Nataliya Maksimchuk, a chemist at the Boreskov Institute of Catalysis in Novosibirsk, Russia. There may be practical hurdles to finding industrial applications, she adds, but there is 'no doubt' that the work is 'some kind of breakthrough'.